Welcome to te LnBlog walk-through! In this series of entries, I will be walking you through the process of setting up a weblog using LnBlog, from initial installation to advanced customization. It is my hope that these articles will serve as a guide to help new users get up and running quickly and to help encourage people to try out LnBlog. If you have any questions or feedback, please feel free to post comments or e-mail me privately. I will do my best to answer all questions. So, without further ado, let's get to it! Today's installment will cover installation and initial configuration. This will take you from zero to the main administration page. LnBlog doesn't have much in the way of requirements. In fact, that's half the point - it's meant to work well on both low-cost shared hosting accounts and full-featured hosting. The only hard and fast requirements are PHP 4.1, the standard Perl-Compatible Regular Expression extention (which nearly every installation should have), and the ability to write files, either through PHP's normal functions or via FTP. Support for the less-common gettext, CURL, and fileinfo or mime-magic extensions is recommended, but not required for proper operation. Things will work better if you have them, but don't worry about it if you don't. After downloading a copy of LnBlog, the first order of business is to get it on your web server. To do this, simply extract the LnBlog-version.zip file to your hard drive and upload the resulting folder to your web host. You will probably want to rename the directory to remove the version number, so that upgrading to a newer version will be easier. Note that you need to upload the folder to someplace under your document root directory, i.e. somplace where you can get to it with a web browser. To configure LnBlog, fire up your favorite web browser and point it to the URL corresponding to where you put the LnBlog folder, e.g. http://yourhost.com/LnBlog/. This will launch the file writing configuration screen, seen here. The first section asks you to set the path to the document root directory on your web server. LnBlog will calculate a default value for this. The default should be right for your setup, but you can change it here if it's not. If you're not sure, try the "test document root" link to run a simple test. The second section on this page asks you to configure file writing. Here, you have two choices. 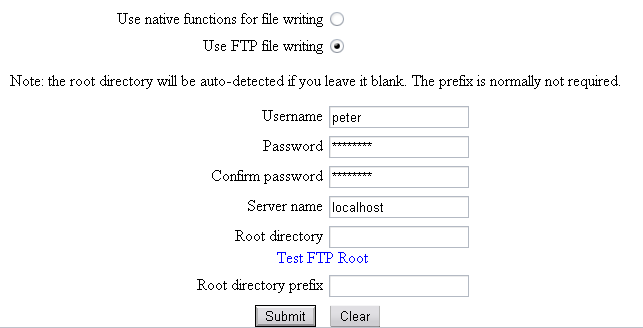 You can either use PHP's native file writing functions, or you can write files through FTP. For shared hosting accounts, especially cheap ones, the recommended setup is to use FTP file writing, because you won't have to worry about safe mode or directory permissions. 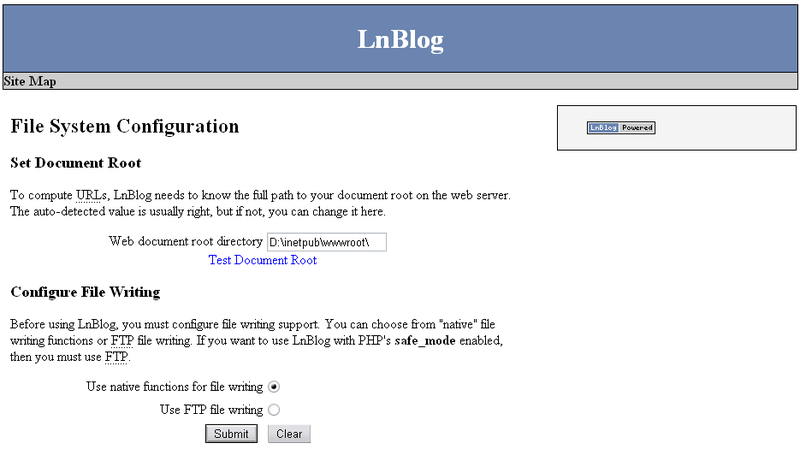 If you choose native file writing, no further configuration is required within LnBlog. However, there are a few things to keep in mind. First, native file writing won't work with PHP's safe_mode enabled, so you'll have to get your hosting provider to turn it off for your account. Also, you will have to check the file permissions on the web server and make your LnBlog/userdata folder writable to everyone. Keep in mind that when you create new blogs, you will also have to the directory where you create them writiable to all users. Because file permissions have to be handled manually, native file writing can be harder to manage, especially when using shared hosting accounts. FTP file writing should not require many manual setup and it works just fine when safe_mode is enabled. However, it does require that you have FTP access to your web space. It also requires some extra configuration. You will need to provide a username and password for a user account which can upload files to your site via FTP. LnBlog will assume that the FTP server is running on the same machine as the web server (hence the name localhost) and will attempt to calculate the root directory for FTP access automatically. This should work for most configurations, but you can also specify these manually if you need to. 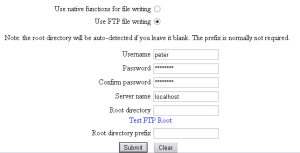 You can click the "test FTP root" link to get a simple test page that will attempt to connect to the FTP server and calculate the FTP root directory. Once you have picked your file writing method, click the submit button. If all goes well, you will be taken to the user creation page. 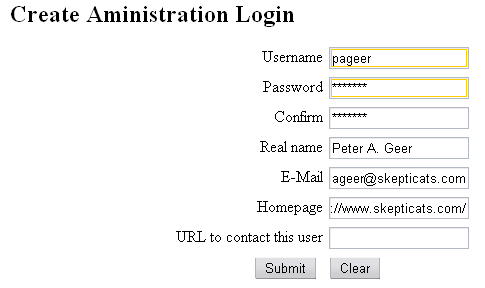 This page allows you to create a new user who will serve as the system administrator. That means that this user will be able to create other user accounts, create new blogs, and make changes to any existing blog or post. In other words, an administrator is allowed to do anything that can be done in LnBlog. As for the fields themselves, you can enter any username you like. The "real" name is the name that will be displayed as the author's name on posts you create, so it is recommended that you specify some name here. An e-mail address is required if you want to get e-mail notifications of replies (i.e. TrackBacks, Pingbacks, and reader comments). The homepage is purely for informational purposes. Lastly, the contact URL allows you to enter an HTML like that allows people to contact you. If you enter a link here, then that will be displayed in your profile instead of your e-mail address. 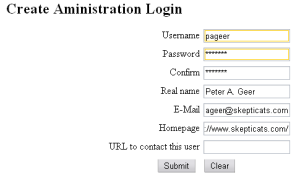 Once you have successfully created your account, you will be redirected to the login page. Note that this first user account will be automatically marked as the administrator, so you will be able to use this account to log in and administer LnBlog. This includes editing configuration files, creating new users, creating new blogs, and so forth. We'll take a look at the administration page and creating anew blog in the next installment. Great site - lots of different points of view! I have to add this website to my favorites! Enter the product of 28 and 75.